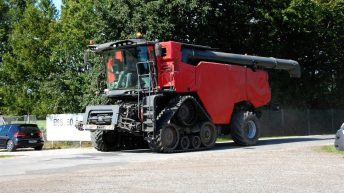 Home » Machinery » Is AGCO’s latest creation the ‘Ideal’ combine harvester? 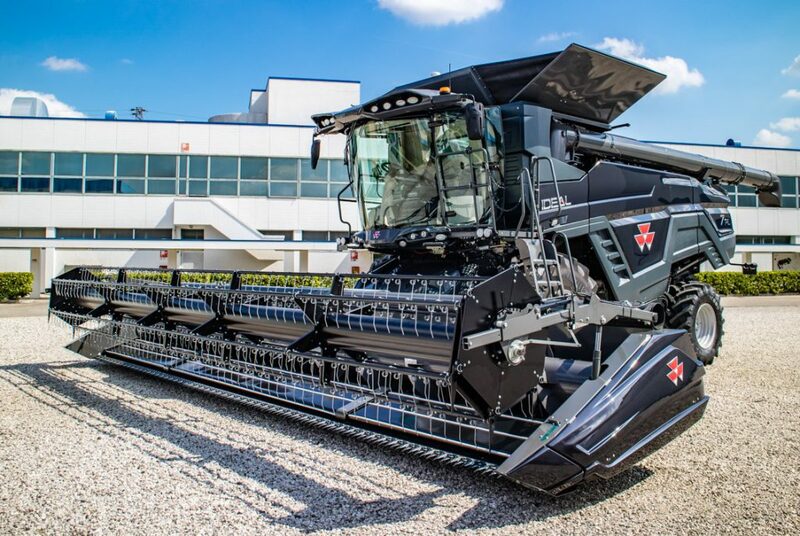 Is AGCO’s latest creation the ‘Ideal’ combine harvester? It’s not often in the machinery industry that a company gets the opportunity to develop a machine from a blank sheet – with practically no constraints. So often, new machines are evolutionary developments of, or updates to, existing machines. In fact, it has been over 30 years since a truly “new” combine has been developed, according to AGCO. It says that it has just completed the biggest product development project in its history; its new ‘IDEAL’ combine has now been unveiled – ahead of a full public outing at this year’s Agritechnica show in November. The IDEAL is the culmination of over five years of development – at a total cost rumoured to be in excess of €400 million. 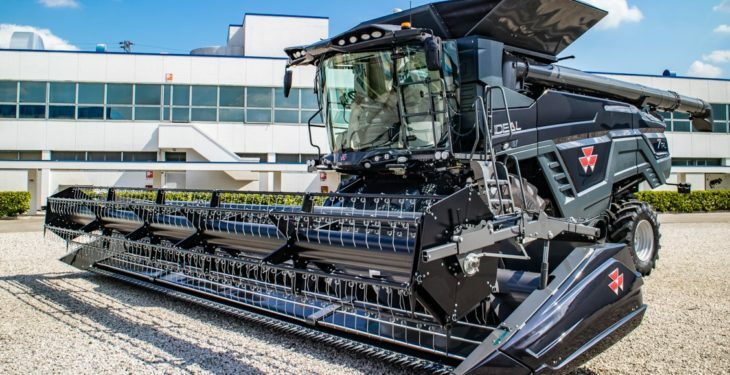 AGCO – the parent company of well-known brands such as Massey Ferguson, Fendt, Valtra and Challenger – decided as part of its strategy to become a “full line” manufacturer to design a combine that it claims is “revolutionary”. The very first step in the process, according to the company, was to go out and listen to customers – chatting to them around the kitchen table or up in the cab of their existing machines. After hearing about their needs, and the problems they had encountered, this effectively kicked off the first stage of the design project. AGCO says that, among other things, customers demanded more capacity, productivity and, in so far as would be practical, full automation. The first step was to build the combine from the inside out. This meant that the heart of the combine – the threshing system – was developed first in the lab. It was then grafted into three “mule” machines – combines that outwardly resembled existing, older models. This field-testing phase happened back in 2014. The results were so impressive, claims AGCO, that – by this year – 22 pre-production units were out working around the world in some of the most testing crops and conditions. 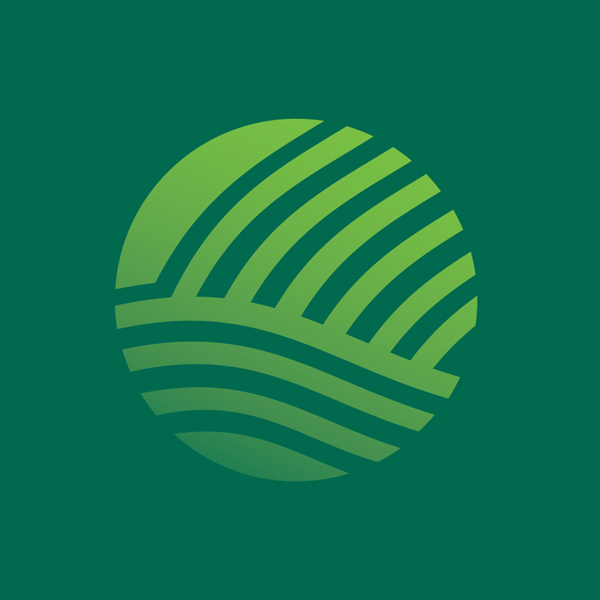 This, says the company, is to ensure that the machines can be marketed as “global” harvesters. In total, the IDEAL – as it’s called – was subjected to over 250 different field tests and 195 laboratory trials during its development. AGCO assuredly says that it “can not only talk the talk, but also walk the walk”. So what makes the IDEAL so revolutionary? To start with, it is aimed at the “professional user”. Three model types are on offer – namely a 7, 8 and 9. These machine types can be further subdivided into three versions. These are: the standard or “flat land” combine; the PL (designed to work on slopes); and the T (tracked version). Starting at the front, the IDEAL can be fitted with headers of up to 12m (40ft) in width. A larger 50ft version is rumoured to be close to production. Lifting such a large header is apparently no problem, thanks to the IDEAL’s rated lift capacity of 6.5t – that’s the equivalent of a typical Irish tractor. One of the main design goals was to keep the IDEAL as compact as possible – for ease of use on narrow roads. The machine, excluding its header of course, has a total transport width of just 3.3m (when fitted with 800mm tyres or 600mm tracks). The track drive-system was specially developed in conjunction with AGCO’s Jackson track facility; the triangular units incorporate hydraulic suspension. They provide a generous, on-the-ground footprint of up to 2.55m². The IDEAL has a top road speed of 40kph; the hydrostatic transmission has two shift-on-the-go mechanical speed ranges. Muscle is supplied by an AGCO Power (Sisu) 9.8L, 451hp engine in the IDEAL 7. The bigger IDEAL 8 and 9 are fitted with MAN 12.4L (538hp) and 15.7L (647hp) units respectively. Now the clever bit – the processing unit. IDEAL combines are fitted with a “unique” helix-inspired threshing and separating system. According to AGCO, grain is separated “cleanly” without impacting unduly on straw quality. This lofty assertion is backed up by the longest rotor on the market today; it spans 4.84m and sports a diameter of 600mm. In order to handle the crop as “carefully” as possible, and to ensure a constant load on the rotor, the intake augers, threshing bars and rotor fingers are arranged in a spiral pattern – a similar pattern to DNA (AGCO’s words; not ours!). This processing unit is said to require “much less power than other systems”. Claimed power savings are in the 20-50% range; AGCO’s approach is also said to boost output. The IDEAL 8 and 9 are both fitted with ‘Dual Helix’ threshing units which, as the name suggests, have two rotors. The smaller IDEAL 7 uses a ‘Single Helix’ threshing unit – with just one rotor. Both systems can be reversed from inside the cab. Threshed grain falls from the rotor onto the IDEAL’s next novel feature. Two plastic, curved grain pans are fitted at the front of the threshing unit; this means that the front end of the preparation floor can be filled with crop. The rear grain pan catches material from the separation area, and distributes it in the rear area. The entire length of the preparation floor, claims AGCO, is utilised fully. The crop is evenly distributed. The curved profile of the grain pans also allows “optimal and consistent output” – even on slopes. The company says that losses on gradients of up to 15% are reduced, compared with “conventional” combines. Clean grain is transferred up to the grain tank. AGCO says that it’s the largest on the market at 17,100L – apparently 18% more than its nearest competitor. Even more impressive is the speed at which it can empty – 210L per second through a 42cm unloading auger. This is claimed to be 32% faster than its rivals. One of the biggest challenges, even for experienced combine operators, is the need to constantly fine-tune the combine – to suit ever-changing conditions. To address this, the IDEAL monitors the capacity status of the threshing and cleaning systems, in ‘real time’, using 52 acoustic mass sensors. Using these sensors, in conjunction with a grain quality camera, allows grain losses, the percentage of cracked grains and grain purity to be displayed. The driver can glance at the iPad display, again in ‘real time’, to see whether material is showing up at the front, left or right of the processor. The driver can also set the desired balance between output and quality; the machine then adjusts itself on an ongoing basis – reacting in ‘real time’ to changing harvest conditions. Finally, up top, the glass-adorned ‘Vision’ cab offers plenty of room and great views. AGCO will officially launch the IDEAL at Agritechnica; full production will start shortly after – in preparation for next year’s harvest. All machines are finished in a graphite livery (paint scheme); the only differentiation between the brands will be the badge, decals and logos. It’s expected that the IDEAL will be sold in Europe under the Fendt and Massey Ferguson banners. In North America, it will be badged as a Challenger. 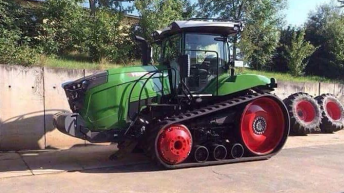 In South America, it will be marketed as a Valtra machine. AGCO plans to build 2,500 IDEALs in the first year – for sale all over the world. How long before one makes its way to Irish shores? Only time well tell. As with novel developments around the globe, there us often an Irish connection somewhere. The IDEAL is no different. Kildare man Barry O’Shea, who joined AGCO back in 2000 as a Fendt specialist in North America, headed up the entire IDEAL project from start to finish. Next-generation flagship harvester from AGCO: Is this it? 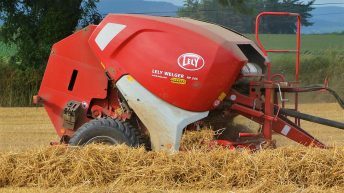 Welger balers and Lely silage wagons to go Fendt ‘green’?